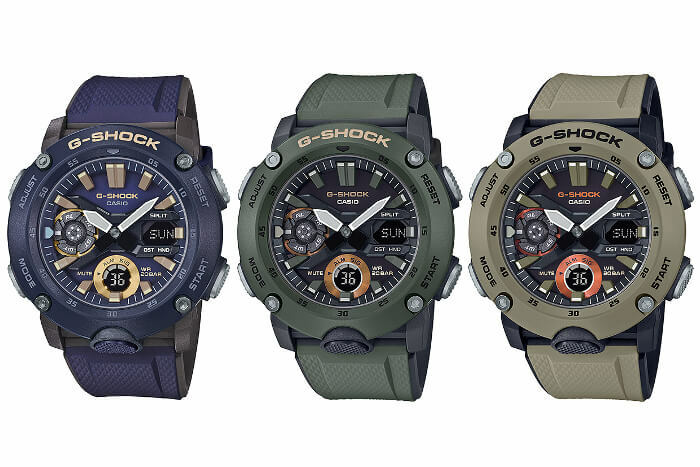 G-Shock launched the new GA-2000 line with three vivid colorways and is now offering three more conventional, military-inspired colorways for April 2019. 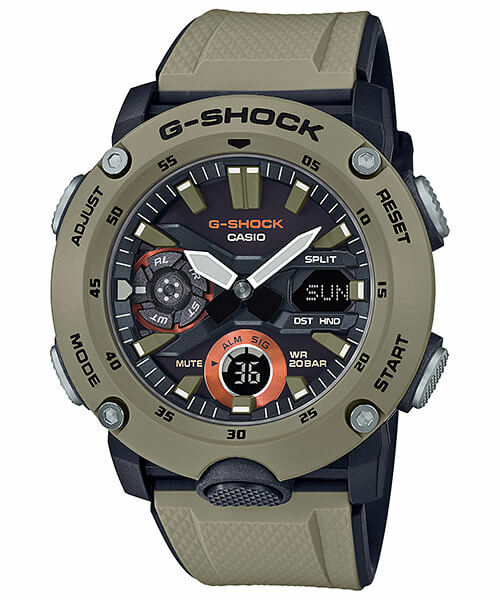 The GA-2000 is the most affordable G-Shock line to utilize the new Carbon Core Guard case design. The lightweight carbon fiber reinforced case features a very high strength and hardness for improved durability. Other features include a dual-layer stainless steel and resin case back and bi-color molded bands. 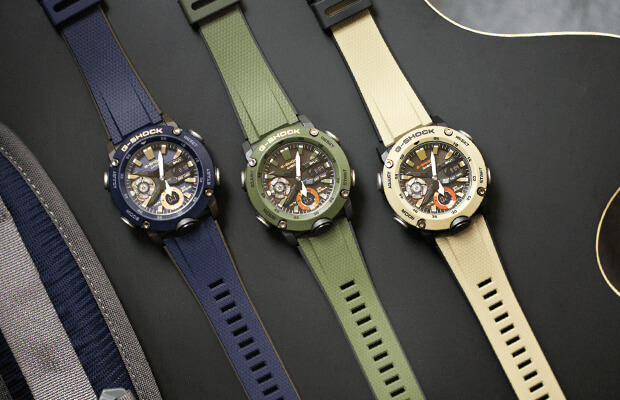 The GA-2000 is also the first G-Shock watch to feature a quick-release band and different styles of bands (Velcro, Cordura, and cloth) will be available to purchase separately. 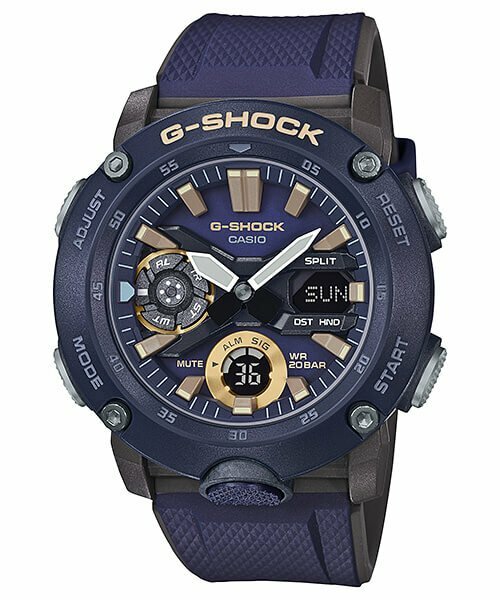 The GA-2000 features shock resistance, 200-meter water resistance, world time (48 cities + UTC, DST on/off), 1/100 second stopwatch (24 hours, with split), countdown timer (24 hours), 5 alarms, hourly time signal, button tone on/off, full auto calendar, 12/24 hour format, dual LED lights (Super Illuminator LED and LED backlight for LCD with 1.5/3-second afterglow), and estimated 3-year battery life. The GA-2000 measures 51.2 x 48.7 x 14.1 millimeters and weighs 64 grams. The GA-2000-2AJF, The GA-2000-3AJF, and GA-2000-5AJF are April 2019 releases in Japan with a list price of 16,000 JPY each. The GA-2000-2A, GA-2000-3A, and GA-2000-5A will also be released throughout Asia. The GA2000-2A, GA2000-3A, and GA2000-5A are scheduled for a May 2019 release in the U.S. with a list price of $130 USD each. The GA-2000-2A features the traditional Navy colors of blue and gold. 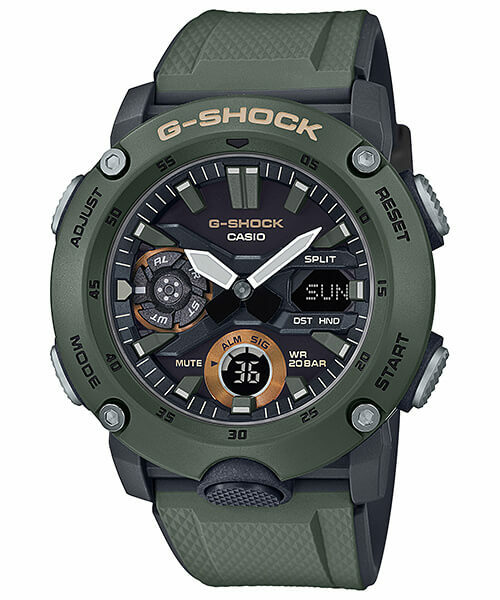 The GA-2000-3A has an olive green color that matches woodland environments. The GA-2000-5A has a brown color that matches woodland and desert environments. Why are the tan, forest green and navy color not available in the U.S.? I have found them on eBay, and have deeply considered buying one, but I’m wondering if there is some specific difference between the Japanese/Asian version of the ga 2000 and a possible future U. S. version in tan. Should I just get it on eBay from a Asian retailer? All three are scheduled to be released in the U.S. in May. The U.S. (and other markets outside of Asia) usually get the new models a month or so later than Asia. There is no difference between the Asian and U.S. versions, just the last two letters of the model code on the tag and box sticker (which could be JF, DR, CR, etc.). But depending on where you buy it from it may or may not include a Casio warranty, or may not include one that is valid in the U.S. That is one reason to wait for the U.S. release and buy it from an authorized dealer.